Home is an irreplaceable comfort zone! New journey starts from the bedroom. The emphasis is not on product, but on attitude towards life. 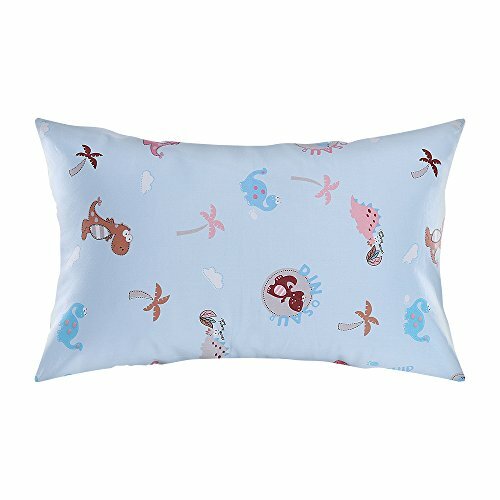 ALASVILLE pillowcase provides newborn baby healthy and comfortable sleeping. Let's enjoy sleeping life from ALASVILLE! Why Choose 100% ALASVILLE Organic Cotton Toddler Pillowcase? 100% cotton fabric is breathable and sweat-absorbent and fells soft to touch that will give your baby a high quality of sleeping. We don't add any harmful chemicals during the printing and dyeing process such as formaldehyde, azo and fluorescent etc. Manufacturing process makes it not easy to fade or pill and will always keep the high color fastness as new. There is a wide variety of patterns to choose from. Parents can co-ordinate pattern and colours with bed products at your own will. ALASVILLE pillowcase is anti-allergic, antibacterial and anti-mite that can fit the skin without irritation. Envelope style can hold the pillow securely, prevent the pillow slips from the case and make it easy to place pillow cores or take case off for washing. Product size: 13" x 18"
MATERIAL - ALASVILLE pillowcases are made of premium 100% hypoallergenic cotton which is breathable, comfortable, antibacterial and anti-mite. The non-fluorescent material is gentle to your baby's sensitive skin. BEST PRESENTS TO YOUR BABY - Alasville pillow can make your baby enjoy deep, comfortable and healthy sleep as well as provide a sweet dream. ENVIRONMENTAL PRINTS AND BEAUTIFUL COLORS - Available in 17 different cute patterns. You can decorate your baby room in several natural ways. It fits all toddler pillow size 13"x18". Moreover it's machine washable and dryer friendly. DESIGN - Envelope enclosure design can hold the pillow securely, prevent the pillow slips from the case and make it easy to take case off. WARRANTY & QUALITY - Alasville pillows cover a 10-year quality guarantee when used under normal conditions. If you have any questions about this product by ALASVILLE, contact us by completing and submitting the form below. If you are looking for a specif part number, please include it with your message. Marvel Spider-Man, 3D Ultra Stretch Cloud Pillow, 14"